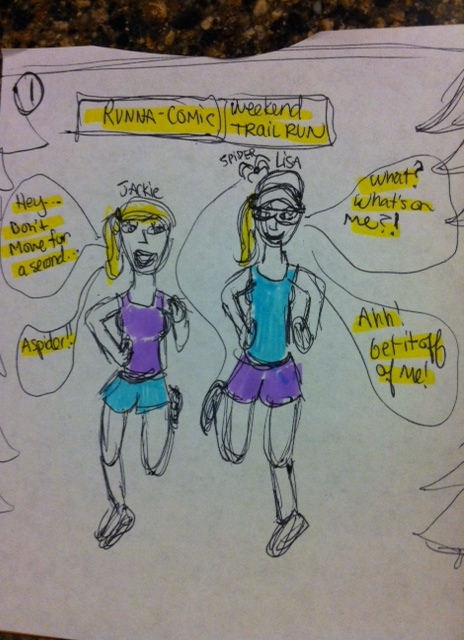 Instead of writing a blog while in dead dog mode from training, I enjoy drawing, so did a quick lil’ sketch…Here is a lil’ blog/comic that was pretty funny in person, but a maybe you had to be there type moment…I seem to have quite the run’ in’s literally with nature/wildlife. 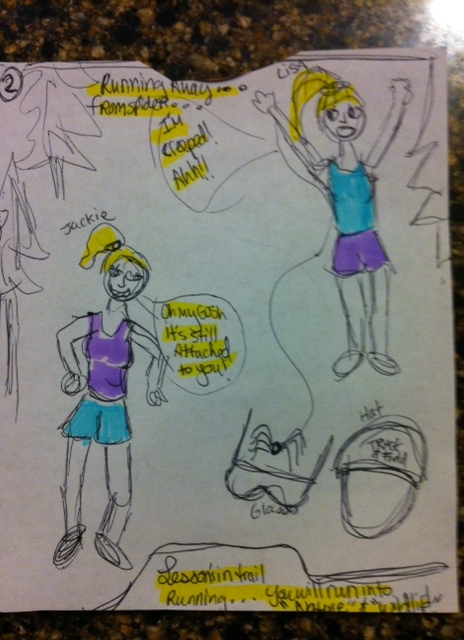 Last weekend, I was running with a ginormous spider attached to my sunglasses that was on top of my hat. YUCK & YIKES! Jackie casually tries not to scare me and get it off lol. I throw the hat and glasses off, and feel creepy heeby jeebies head to toe, and run around in a circle screaming, Jackie is screaming etc. Then While I’m running in a circle screaming, “Where is it!” She says its still attached via long thread spider web dancing off of my shoe like a fishing line with the bait being the spider, me being the pole! WOWZER! Anywho, I can say while running on trails I have come across the following creatures, deer, squirrel, fox, vulture, chipmunk, spider, owl, & yes even turkey & their turkey babies. WOWZa I will save that story for closer to Thanksgiving! lol. ← NEW Runnababez GEAR! HOT for Fall RACING!